DID SATHYA SAI BABA SAVE A PASSENGER JET FROM DITCHING IN THE OCEAN? The alleged 'aeroplane miracle' over the South Atlantic by Sai Baba - reported in the late 1980s - is still propagated as genuine on the Internet and within the Sai movement, despite having been shown to be a falsification. It was thoroughly investigated by Dr. Leonardo Gutter, the head of the Sathya Sai Organisation in South America, who replied to an e-mail from me at the time with the information that the aircraft and air hostess were completely unknown by any airline operating in South America in the period in question. Nor was anyone found who had been on such a flight and the source of the photo and of the whole account were also untraceable. "In the year 1995 an airplane occupied with passengers flew over South America, when the engine suddenly suspended. The airplane lost rapidly at height and leaned in the dive dangerously to the side. The pilot knew that a venezuelische hostess on board was, which in Sai Baba believed. He began to call: "request your Guru to take us out of this misfortune! The hostess had expressed hardly the name Sai Babas, when its shape appeared suddenly direct in the sky before the cockpit. At the same time the airplane won again at height and the engine started again. 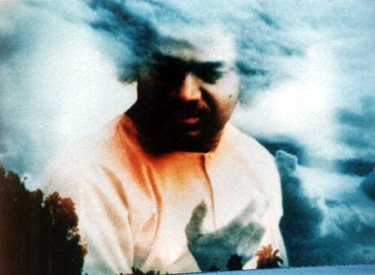 The feature of Sai Baba visibly remained after the incident still further 20 minutes in the sky - during this time the venezuelische hostess took up the photo of the feature, visible on this side. The airplane achieved its goal without further obstacles." The first account of the incident claims it happened while flying over (i.e. crossing?) the coast from the Atlantic ocean. One can clearly see a leafy tree (bottom left) and apparent palm tree tops beside Sathya Sai Baba’s hand. However it is stated that the photo was not taken then, but later during the 20 minutes Sai Baba was visible. The aircraft gained height as soon as the motors worked, and would certainly not have flown so low that trees seen very close by would have been so visible. Moreover, both Sai Baba's hair and his hand are represented as clouds - which most strongly indicates that the image has been manipulated. The dates in the two accounts differ by 10 years - but this is typical of Sai devotee inaccuracies and sloppiness with facts. Peggy Mason was a highly uncritical editor of her magazine, where she published all kinds of hearsay without checking her sources. This I know from having visited her and her husband, Ron Laing, in 1987. There, incidentally, Ron Laing also showed me the alleged "white diamond" ring that he believed was materialised before his eyes by Sai Baba. The largish stone, in a gold lotus setting, was already unclear as it was badly scratched and worn down at the edges (this cannot happen to genuine diamonds - see here). The stone was enclosed at the back, as are all such 'Sai diamond' rings, concealing their synthetic nature and hiding a piece of silver foil to enhance their brightness (found in all such rings opened so far). None show the slightest critical sense - all are blind believers' web pages. 43 00:07:37:09 00:07:39:15 Are you scared of flying? This is a very popular story that was doing the rounds in 1995-6. Myth: An aeroplane, preparing for landing, in Venezuela, ran into some very serious trouble. The pilot announced that all was lost. A Sai Baba devotee on board prayed to Sai Baba, and saw Sai Baba appear in the skies!!!! He appeared to be holding his right hand, palm facing up, and actually holding the plane, till it landed safely. The Sai Baba devotee, quickly took out her camera and snapped a picture of "Swami in the skies, among the clouds" (Rs 50-/ in PN, by the way ) . This incident was reported in The "Venezuela Times" next day as "Indian Saint appears in mid air to save plane"
Effect: Spectacular!!! What a great miracle!! Swami is giving another example of his Omniscience and control over nature and saving Grace!!! Reported to all and sundry, along with thousands of copies of the photo sold and distributed. When Sai Baba was asked about his comments, he said grandly after taking a look at the photo "where a devotee's heart is pure, Swami would even save hundreds of people by traveling anywhere". Later, news trickles in from the inner circle that actually as the plane was going to crash, Swami was telling those around him that he had just been to the other part of the world to save a plane as a devotee had called. How fantastic!!!! Fact: Like most landings, the pilot was expecting a bumpy touch down, that is all. And like all Sai Baba devotees (if any of you have ever flown with Sai Baba devotees, you will know what I am saying), this particular devotee instantly started praying to Sai Baba. She had with her a copy of "Avatar" by Howard Murphet which she was reading and held the book close to her heart. As it was quite into early evening and slightly dark, she saw the reflection of the photo on the book cover on the glass window of the plane (the picture she took is an exact replica of the photo on the cover of "Avatar", surrounded by clouds). She was already in a panicky state of mind, and greatly excited, snapped what she thought she saw through the glass window, with her camera. The situation with the plane was ok, and they landed alright. This was never reported in any newspaper, and there is no paper called "Venezuela Times". All the extra stories about Sai Baba talking about the incident when it is supposed to have happened were later additions, and Sai Baba had later addressed a person during a group interview and said " didn't I tell you when I was going to save that plane? " and of course, the close devotee said "yes, you did, Swami" , who would quarrel with God ???? Result: One more spectacular "miracle" goes into the records!